The highlight of the weekend didn’t come at Hampden Park as Rangers picked up the Petrofac Training Cup final. Nor did it come at Tynecastle where Hearts roared back from a one-goal deficit to defeat Aberdeen in a pulsating match on Friday night football. 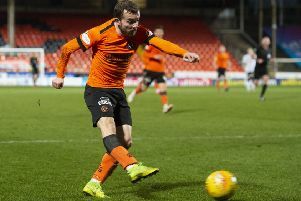 Though you may not have seen it, as neither BBC Alba’s 60-minute highlights package or Sportscene programme thought it worthy of inclusion, the most incredible piece of football play from this weekend, or any weekend, came at Tannadice. With the hosts trailing 2-0 to Inverness CT and falling further into the relegation mire, centre back Gavin Gunning decided he’d had enough. When a short pass went his way, he calmly bent down and picked the ball up. There had been no whistle, no indication of a stoppage in play, Gunning had just decided he wasn’t willing to carry on any more. Ball in hand, he walked the short distance to the United dugout, only to be told by manager Mixu Paatelainen that, if he was indeed injured, which seems the only plausible explanation, he needed to return to the field of play for treatment so United could get a substitute ready. Gunning complied then got up a short-time later and walked down the touchline towards the tunnel, situated at the corner of the ground. On his way he was mercilessly jeered by his own support, to which he responded by sarcastically clapping. Gunning wasn’t booked for this, the most deliberate of all the handballs, which may baffle some fans watching. Under prior rules, this would have been the clearest yellow card you could ever see. However, since the rules were changed so that handballs had to be deliberate to even be considered a foul, it meant a booking was no longer an automatic punishment for the infringement. Instead, referees are instructed to only issue yellow cards if the handball stops a promising attack. This is not to be confused with “clear and obvious” goalscoring opportunities, which still merit red cards. It’s the most bizarre act ever committed by a player who regularly indulges in ridiculous behaviour on the football field, usually when it comes to his duties as a defender. There’s no centre back in Scotland as eccentric as the Irishman, which is far from a good thing. You want your centre backs to blend in with the background, quietly going about their job of denying the opposing team. This characteristic could be forgiven if his presence, similar to former unorthodox defenders in the Scottish league, such as Marius Zaliukas at Hearts or Lorenzo Amoruso at Rangers, actually made the side better. Instead, he’s been consistently poor since returning to the club for a second spell. His positioning and decision-making have not been up to scratch. On counter-attacks, while the opposing striker races through on goal, Gunning can often be viewed as the stationary target 10 yards behind the play with his hand in the air. Regularly in the recent Dundee derby, match analyser Chris Sutton savaged him for such behaviour. Despite all this, he remains one of the first names on the teamsheet. It will be interesting to see what Paatelainen does with his defender. United supporters, to a man, want him to never feature for the club ever again and, with his contract running down this summer, they may get their wish. However, the United boss will not give up on the relegation battle until it’s mathematically impossible, especially as they’ll be playing sides in the bottom six across their last five games. Unlikely as it may seem, four wins against their fellow strugglers would still give United a fighting chance. As poor as Gunning has been, the likes of Sean Dillon, Coll Donaldson and Mark Durnan have not been much better. The idea of playing Gunning may be looked upon as a necessary evil by his manager. At the same time, this type of attitude has typified United’s struggle all season long. Mentally, they have been weaker than any other side in the top flight, possibly even the country. They’ve regularly thrown away points in games that appeared under their control. Rewarding Gunning for this act, regardless of whether he was actually injured or not, would send out completely the wrong message to the supporters and other players. With every game a must-win scenario, Paatelainen cannot condone the acts of someone who seemed to just give up.